“Did you kill a nice buck this year?” That’s a question that I get asked dozens of times at every outdoor show I attend every winter. A year ago everyone already knew the answer as I had just killed 2 world-class bucks that I had named Smokey and Trump on back-to-back hunts. The fact that these bucks totaled over 400” helped fuel the fire as word spread across the internet and even made Fox News website. This year is a bit different however as I only shot one arrow from a stand all fall; at a coyote which I promptly missed. To say or think this season was a failure would be completely wrong however. I had 3 different 170 class bucks in to stands that could have easily worn my tags had I chosen to shoot them as well as another buck over 160”. These are bucks I was familiar with before seeing them from a stand but they were not on my hit-list however. To my knowledge all are still alive and should help make for an exciting season next fall. 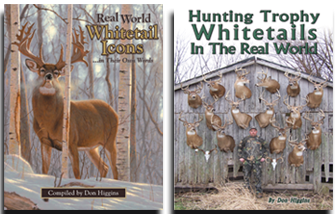 Trail Cameras – While I knew that I would never duplicate the season I had in 2017, I hoped to follow it up with another giant in 2018. This led me to go on a trail camera binge. As the summer and early fall rolled along I bought more and more trail cameras and covered more and more area with them. Looking back I am certain that I became too aggressive with the cameras, especially on properties that I already know very well. I became over-confident in my trail camera skills and sometimes placed them too close to stands or even potential stand locations. I have become quite proficient at getting a bucks photograph but sometimes it comes at the expense of the chance to kill him. Next year I will be keeping trail cameras away from most of my stand locations. Another mistake I made with trail cameras is placing them right along trails facing down the trail. A deer walking down the trail would be walking right at the camera placed next to the trail. This makes for some great photos but it also spooks a certain percentage of mature bucks. Many of them I would only get their photo one time at a location. I even had one situation where the deer diverted around a camera creating a new trail to avoid it. For 2019 I will be placing my trail cameras further off to the side of deer trails and facing them at a right angle to the trail rather than facing down the trail. I will also place the cameras a bit higher in the tree angled down towards the path. While I am sure there will still be some bucks detect the cameras and avoid them, I am sure it won’t happen near as often. Placing a game camera so that it faces down a deer trail will get you some good photos but it also spooks some bucks. It is a tactic that I will be using less often in the future. Due Diligence – In 2018 I leased two different properties to chase two different giant bucks based solely on the word of trusted friends. I have no doubt that in both cases my friends were not misleading me but I made too many assumptions about these bucks without concrete proof. In both cases I did not get a single trail cam photo or lay eyes on the buck in question. In fact, I never had a photo or saw a single buck I would shoot on either property. In the future I will continue to chase down every lead that I get from a trusted source regarding the whereabouts of giant bucks. However, before I go hog-wild in my efforts I will verify that the buck is indeed on the property I am forking out money to lease. Octobers Opportunities – I have long known that October can be a great time to kill giant bucks. In fact I proved it myself in 2017 with Smokey and Trump, both of which I tagged in mid-October. Even so, I have not been as aggressive in October as I need to be. This is a great time to tag a giant before the rut and hunting pressure makes it more difficult. In the future I will be putting a bit more effort into my October hunts. I will be putting more effort into tagging giant bucks in October. Don’t be surprised to see me posed behind this brute next October. Yesterday on my final hunt of the season I had numerous options of where to hunt. I could have hunted a farm where I was likely to see several deer including some nice bucks but the odds of seeing a shooter was almost zero. With 2 buck tags still in my pocket I could have likely culled a buck from that farm. On another farm I could likely see some deer but likely not any shooter bucks. There was a chance to see a shooter but it was a very, very slim chance at best. The third option was a property where I would likely not see any deer but it gave me the best chance to see a buck I would call a shooter, even though the odds for that were still very remote. Obviously I picked the last option. When you target an individual buck the odds of ever seeing him on a single hunt are very low. Still, one must play the odds. I think one of the primary reasons that I have been able to take my whitetail hunting success to the ultimate level is because it has never really bothered me to end a season without killing a buck. When I set a goal I don’t deviate from it. Empty seasons didn’t matter 30 years ago when I was happy to shoot any 140” buck that came along nor does it bother me today when the goal is one individual animal with world-class antlers. We don’t get better when we compromise goals; we get better when we achieve a goal and then raise the bar to a higher level. Empty seasons along the way are not seen as failures or disappointments but as a step towards something bigger and better. On my final hunt for the season I did see a couple of young bucks. I was hunting from a stand that I already knew I need to move a few yards from where it is currently located before next season. Watching those two young bucks traverse the cover differently than any deer I had previously seen from that stand revealed to me the exact tree I need to have my stand in for next season. On the final weekend of the season when a lot of hunters are compromising goals and looking to fill every tag in their pocket, I was simply looking for one more little piece to the puzzle to help me tag a giant in 2019. Over the years my hunting success has followed a pattern; when I go a season without tagging a buck I generally follow it up with a noteworthy buck the next season. Come on October!! !